Hey guys! Today's look is quite colorful, using blues, purples, pinks, and oranges with a couple duo chromes. 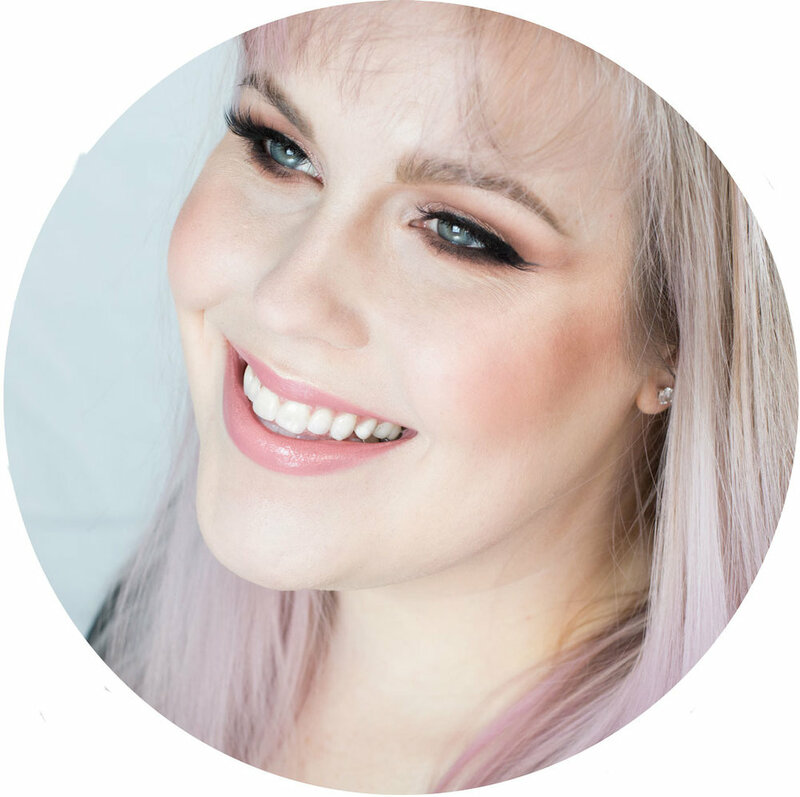 I am giving the new Urban Decay x Kristen Leanne collaboration a go, using the Kaleidoscope Dream palette mostly and a few colors from the Daydream palette since Urban Decay generously sent them to me (this post isn't sponsored though). I'll give some color discriptions as I use new colors so you can find similar shades you may already have in your makeup bag if you don't own this palette. I also tried something new, by drawing on top of the images to better show placement. Let me know if you like this or think I should just stick with just the photo in the comments, I would love some feedback. Wearing the Nubounson serengeti lashes, you can use code 'rebeccashores' for 20% off! Start out by priming your eyes, I am using the Smashbox Photofinish Primer. Then add a base shadow that is matte and close to your skin tone. 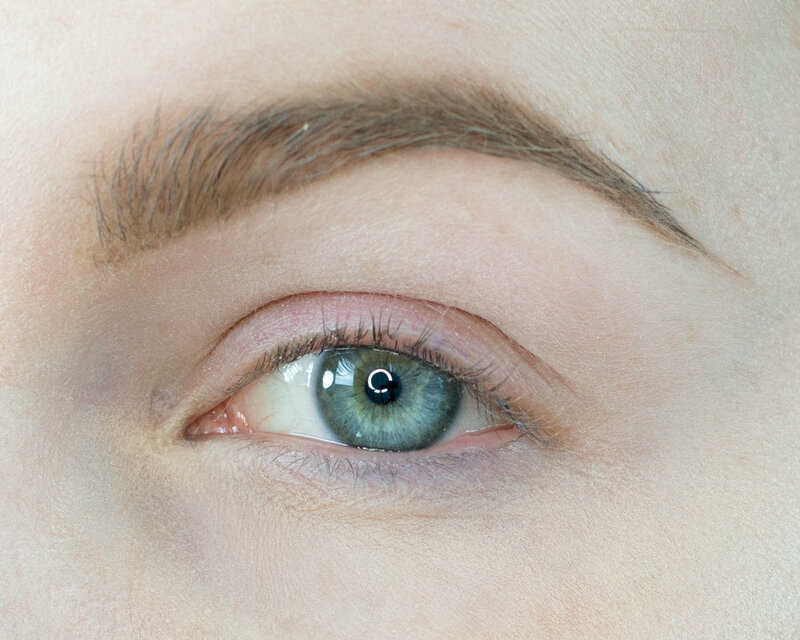 I am using Lucy from the Urban Decay x Kristen Leanne Daydream palette and applying it from the lashline to my brow. Now we're going to get colorful! I am starting with Lime Time from the Urban Decay Kaleidoscope Dream palette, a metallic lime green. I am using a Hakuhodo J242G to pat the color. My first press is where the arrow shows, so that inner third has the highest concentration of color. 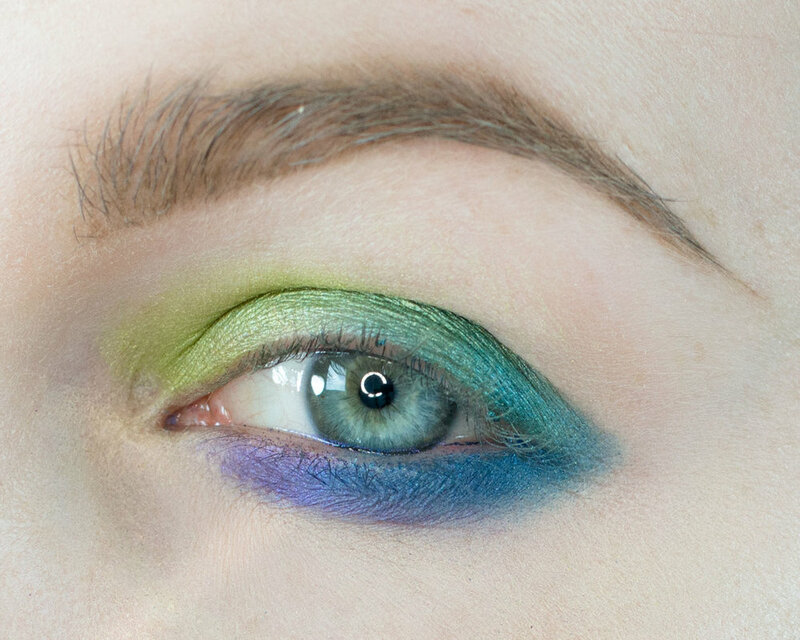 Using the same brush I am adding LCW from the Urban Decay Kaleidoscope Dream palette, to the outer edge, then patting inwards to blend it into the Lime Time. LCW is a metallic teal that blends nicely into the green. Now it's time for a bit of blue, I am adding TRM from the Urban Decay Kaleidoscope Dream palette,, a metallic cool deep blue to the lower lashline. I am using a Hakuhodo J5529 to apply the color, starting on the outer corner hugging the lahsh line and then blending down. Take note that I then follow the hollow of the eye socket as I blend inward and stop going along the lash line to add a bit of a blank space. Using the same brush I am now using DYE from the Urban Decay Kaleidoscope Dream palette,, a satin deep violet, and adding that into the black space on the tear duct area. Blend it out along the socket, hugging the outline of the blue. 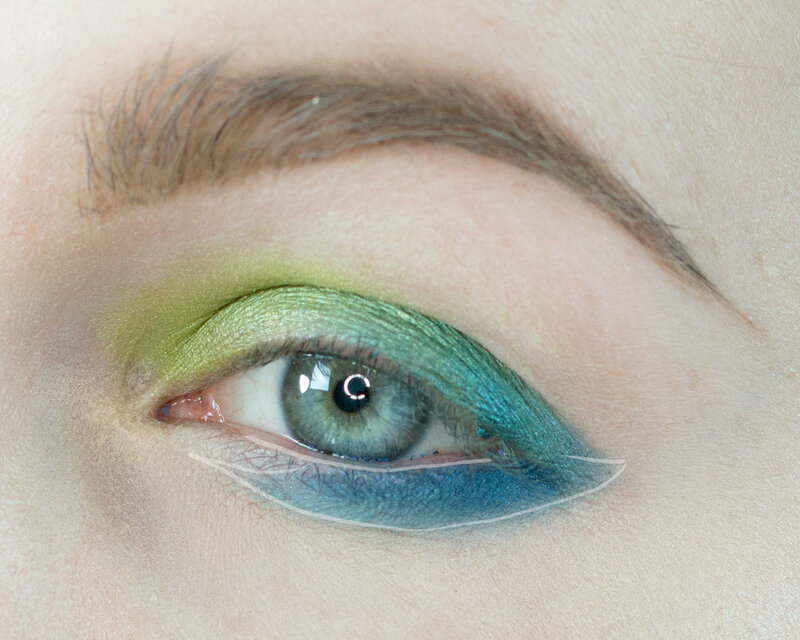 Add a bit of a transition, using Daydream from the Urban Decay Daydream palette apply that from the crease, then blend upwards. 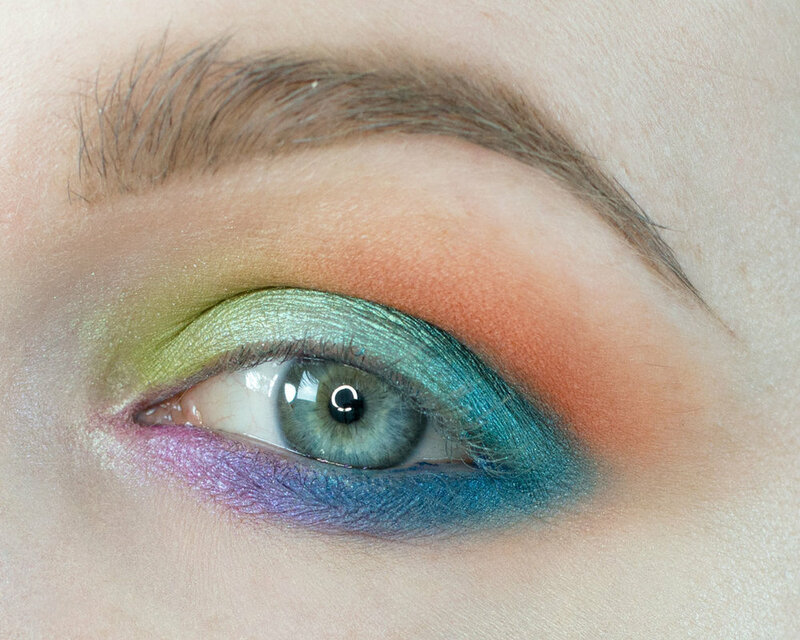 Now to add a bit of a color that'll pop more I am adding Tajin from the Urban Decay Kaleidoscope Dream palette, to the outer corner and crease to add a bit more shape to the top of the eye lid. Now we're getting into my favorite from the palette, Leo and Brixton (a red and green pearl shifts). I added Leo to the tear duct area and then Brixton to the center of the lid. The inner circle is where I patted the color on and then I bended out from there. Here I am just fixing the blend. 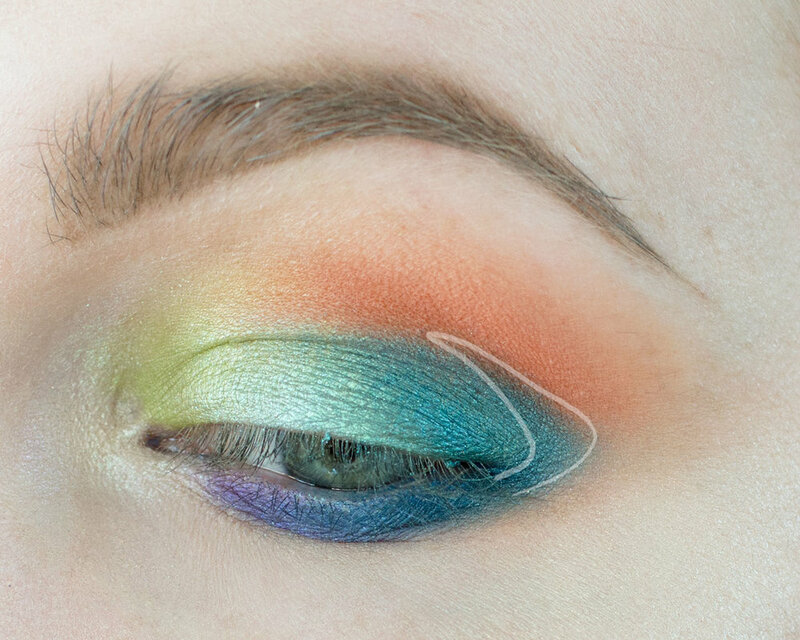 I am taking a bit of Tajin and blending it into LCW with a Hakuhodo J5529 and then the reverse with LCW blending into Tajin and the teal with the orange will blend together to create a more nutral color. I prefer layering colors vs grabing a brown or something, but you could use a rust or black here. Now add just a touch of Spitfire from the Urban Decay Kaleidoscope Dream palette, it's a satin pink with a purple shift. I am using a HakuhodoJ5529 to pop it on the tear duct area and blending in to the purple. Give your lashes a curl and add your favorite mascara and you're all done! I am wearing Maybelline full n soft waterproof mascara cause it's my favorite. I hope you guys liked this look, I sure love colorful looks like this. Let me kow in the comments if you like the second photos with the diagrams drawn on and if they are helpful. Thanks for reading! Phyrra has a comprehensive review with swatches and dupes, so check it out if you're interested in this collection.